How to Apply: The prescribed application form appended below duly downloaded from the website (www.niist.res.in) and filled in all respect may be submitted at the time of Walk-in-Interview. The application form should be accompanied by self-attested copies of testimonial/ certificate in support of age, educational qualification, experience and caste mentioned in the application. The applicant must also bring all the original certificates/testimonials at the time of walk-in-interview for verification. 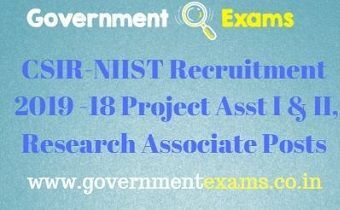 Click here to view official notification: CSIR-NIIST Recruitment 2019 official notification.